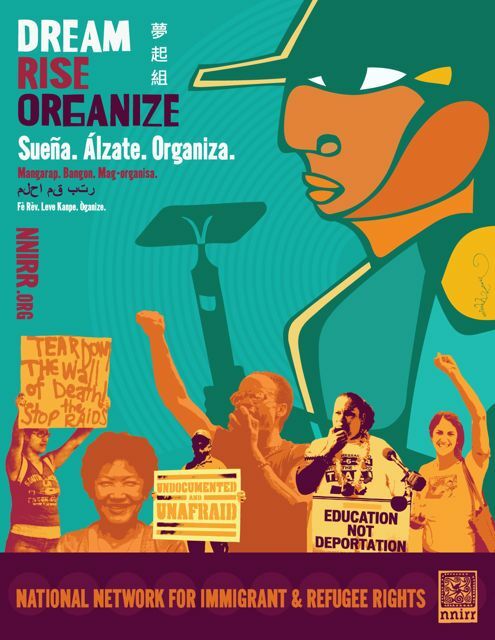 In the one year since Donald Trump was elected President, the immigrant community has been thrown into non-stop resistance and organizing on all fronts. The Trump Administration's daily attacks against immigrants represent a drive to codify racist and xenophobic immigration proposals central to a broad agenda to undermine rights and deny access to critical needs and services. Now, more than ever, we need to strengthen our diverse movements and a common agenda for equality and justice. We invite you to join NNIRR as a new (or renewed) individual or organizational member in this collective effort and critical moment. NNIRR needs your voice, engagement and support to stop the further criminalization of immigrants and refugees; the slashing of legal immigration and the attack on family unity, the cornerstone of immigration policy; travel bans; the closing of Temporary Protected Status programs; severe cuts to refugee admissions; the elimination of DACA; and more. We are alarmed by and condemn this Administration's promotion of racial division and support for White supremacy; war-mongering; attacks on health care access; and a tax "reform" to largely benefit the very rich and increase a national debt that will rest on the backs of poor and working people. Despite the Trump Administration's recent abandonment of the UN's Global Compact on Migration process, NNIRR will continue to work with partners in the U.S. and around the world for strong human rights commitments--for safe, rights-based and inclusive migration policies in the face of desperate, forced migration too often met by open hostility and militarized borders. We'd like all NNIRR members to join us in lifting up migrant voices and interests in the negotiation phase next year. We have our eyes on the long road--where we are building on the intersections, understanding and addressing the "root causes" of global migration, and working towards transformational change. Whether you are a new or old friend, ally or member, our aim is to lift up our partnership. Please join us to advocate for human rights, and for the expansion of protections and justice for immigrants and refugees, regardless of immigration status. Join us by becoming a member today--contribute annual dues and stay connected through our regular updates and calls for action. Fill out the member form here or go to www.nnirr.org and click on JOIN NNIRR, today! Click here to view our informational/membership brochure. Together let's continue to build a vibrant movement for immigrant community resistance and resilience. There is a big need to increase our capacity and action. Your support - as members and/or donors is deeply appreciated. Please click to join and/or donate to NNIRR. Consider becoming a sustainer--your contribution, of whatever size, helps to grow our work throughout the year. Thank you!